An Owensboro, Kentucky man was sent to the hospital for second-degree burns last weekend, when his e-cig battery exploded like a firework in his pocket. And he hasn’t been the only one with such luck. 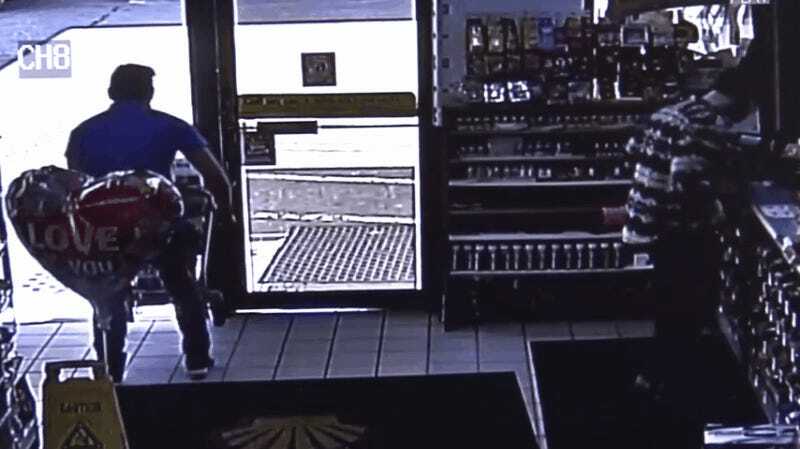 Surveillance footage from a Shell gas station’s security camera caught the incident on tape Saturday morning. The man was about to pay at the register, when a Roman candle-like blast burst from his pants and sent sparks flying. He ran out onto the sidewalk, wrestled off his pants, and was then blasted by a gas station attendant with a fire extinguisher. It’s not the first time an e-cigarette battery has been reported to explode. Just a couple weeks ago, a Texas man also suffered serious burns with a spare e-cig battery went boom in his pants pocket. He, too, was at a convenience store, when the battery blew up and fused part of his jeans to his leg. Yet another man earlier this month in Texas suffered burns, his first degree, when a vape battery blew up in his pants. We’ll have to see if e-cig batteries, like hoverboards, will soon be banned from subways, planes, colleges, and anywhere else that isn’t keen on sudden explosions. The cause of the e-cig blasts is still unclear.